I love the sepan kizhangu curry a lot. Hi dear..how are you..glad to see you back..
Tarro root curry looks great..very nice n delicious recipe. 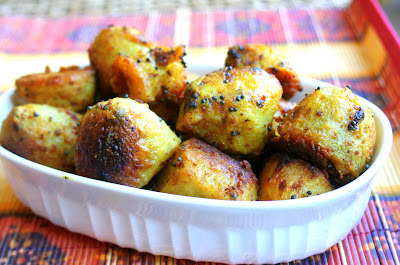 I also use the Ziploc method to marinate the veggies...Lovely looking arbi fry!!! Droolworthy and beautiful looking curry..love it..
hmm.. it looks so tasty.. I never eat Sepan Kizhangu Curry.. But from the pictures, I think I will love that food..
Hi, Thanks for finally giving me a delicious and fool proof recipe for Arbi roast. It turned out great. I just tossed it in a bowl - didnt use the ziplock. What temperature wd you suggest to broil? Mine turned out slightly dry..I did it at 200 deg for 15 min and 300 for 10..so maybe 200 deg for 25 min will be good?